Today sees the release of The Official Raspberry Pi Beginner’s Guide, my latest educational book on the remarkable single-board computer and its software and the first to be made available for free download and redistribution courtesy of a Creative Commons Attribition-ShareAlike-NoCommercial licence. 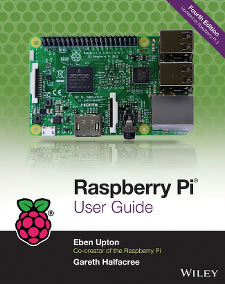 Written in partnership with Raspberry Pi Press, The Official Raspberry Pi Beginner’s Guide walks newcomers through a tour of the Raspberry Pi and what it can do, setting up both the hardware and the software, learning how to navigate the Raspbian desktop, how to write programs in Scratch 2 and Python 3, and even building custom circuits that use the Raspberry Pi’s general-purpose input-output (GPIO) header. If that weren’t enough, there are chapters on using the Sense HAT add-on board, the Raspberry Pi Camera Module, and a handy list of additional resources for when you’ve finally exhausted the book itself. While it’s my name on the cover, this book is very much a team effort. I’d like to thank everyone at Raspberry Pi Press who was involved in its creation, from the authors of the original projects pulled in and updated in this new publication to eternally-patient project editor Phil King, fantastic technical editor Simon Long, amazing illustrator Sam Alder, and a whole host of others without whom the book would be nowhere near as good as it has turned out. The book is available to buy now in all good newsagents, supermarkets, and bookstores, or direct from Raspberry Pi Press. The digital edition, as a Creative Commons-licensed PDF without any digital rights management (DRM) restrictions, is available from The MagPi website now.